News - Actualités - Nyheter - Uutiset! On this page you will find all the latest news! Don't forget to take a look at our recipes on the English and French pages! We have operated successfully since 2013 and want now develop our operations and grow so that we can serve our customers even better. We want to create a new online shop which meets the needs of the clients and the increased demand. An online shop that is fast, secure, flexible and customer-friendly. To fund it, we have now launched a crowdfunding campaign on Ulule. We want to be a place where all the Nordic delicacies and superfoods can be purchased from one place for delivery to whole France, Europe and the world! As always so even this years holiday season we are closed on French national holidays. But we will also be exceptionally open on Sunday 23rd December! The 29th edition of Festival International de Géographie in Saint-Dié-des-Vosges has a special theme this year, the Nordic countries, which means that in addition to the base theme "France demain" the festival presents Nordic culture including for example literature and art. And as we are in France a huge focus is on the Nordic food culture which we alone are responsible for. This means that during these three days a handpicked selection of our products is available also in Northern France. As the Christmas time is going to be around the corner there will also be a Santa Claus -boutique with traditional hand made Christmas decorations and special gift items. We are naturally not able to present our entire selection but it is anyhow possible order in advance anything you wish. Our whole product range can be found in our on-line shop. On our stand there will also be a café, open during the three days from 9h00 until 18h30 serving examples of Nordic delicacies in form of canapés together with our famous cinnamon rolls, refreshments, herbal drinks and coffee. All Nordic of course. Dispite our presence in FIG the boutique in Antibes will be open as usual. The summer is soon to end and thus also we are back to normal opening hours. Until Midsummer 2019 we will be open from Tuesday to Saturday from 10:00 until 19:00 non stop. Closed on French public holidays. From 26th June onwards until September we will be closed for lunch. Opening hours being from 10h - 14h and 16h - 19h. During four weeks beginning on 24th July we will be open only in the afternoons, the exact times will be informed later. On May 25th 2018 the new European General Data Protection Regulation (GDPR), entered into force in all EU countries. The regulation is intended to improve the protection of personal data in order to make you feel confident about how we treat your personal information. We collect and store only information you have given directly to us and it is used only for our e-mail marketing. We do not share or sell the information with third parties. If you want to receive our e-mails also in the future you do not need to do anything. If you do not want to receive them you may any time cancel your prescription by the "unsuscribe from this list" link which is always found in the end of the e-mail. Our entire privacy notice is always found on our web site. As the national holidays occure just those days we even normally are closed the holidays will not affect our opening hours this year at all. To celebrate this year's commemoration of Finland's 100 year anniversary as a independent state, the exhibition Pro Finlandia will be presented in several French cities, even at the Raoul Mille library in Nice from 20 September to 6 October 2017. Please find attached the exhibition brochure. 9.9.2017 Back to normal winter opening hours! The summer, if it ever existed, has come to its end in the North, time for the Nordic migrants to return to the Côte d'Azur. From Saturday 9th September onwards we are back to our normal winter season opening hours, 10:00 to 19:00 non stop! From 27th June onwards we will be closed for lunch. Opening hours being from 10h - 14h and 16h - 19h. During four weeks beginning on 25th July we will be open only in the afternoons, the exact times will be informed later. 24.12.2016 Opening hours during Christmas and New Year! Our extension is now ready and the grand opening of the art gallery on 17th October 2016 was a huge success, thank you everyone who attended. The gallery has it's own homepage and is also on facebook. The current exhibition will continue until 17th November. In our extended café you may enjoy light lunch or snack, now even with a glass of wine if you wish. Or a bottle of Nordic beer from our completed selection. For your morning coffee we now have several different home made bakeries and for your afternoon tea our range of teas is huge. All this in a very Nordic athmosphere! 3.7.2016 Time for summer vacation! 25.6.2016 Glad midsommar - Hyvää Juhannusta! Even though many of you our dear friends, including us, are not able to spend the Midsummer enjoying the nature by lake shore we sincerely hope you will make the best of it enjoying delicious food in good company. As always during a period of about four weeks in July-August we will be open only for half a day. Please let us know your opinion during which part of the day we should be open. You will find a short inquiry here, to answer it will take only a minute of your time. Författaren av den nyutkomna boken DRÖMMEN OM RIVIERAN - ETT LIV PÅ DEN LJUSA SIDAN Gunilla Bohman är i vår butik och berättar bland annat om historien bakom boken. Under minglet efteråt besvarar hon frågor och signerar böcker. Vi bjuder på lite tilltugg, ingen föranmälan behövs men notera att det finns begränsat med sittplatser. 10.4.2014 On April 6th we had an authors visit - in Swedish. Författaren av den nyutkomna boken UNDER PALMEN I ANTIBES Jerk Wiström var i vår butik och lite kort berättade hur livet i Antibes blev en bok om livet i Antibes. Efteråt under minglet signerade han sina böcker. Boken finns ännu till salu hos oss. 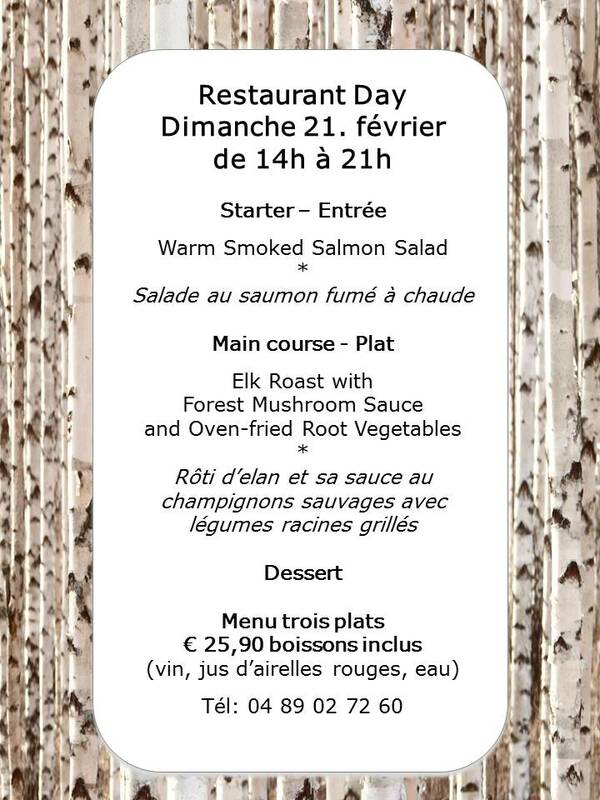 12.2.2016 Restaurant Day with game meat on Sunday 21st February! It's time for Restaurant Day again, this time with Nordic game meat! 20.12.2015 We are exceptionally open even on Monday 21st December! 19.12.2015 The smoked fish and fish roes for Christmas and New Year have arrived! Salmon, Whitefish, Atlantic Halibut, Eel, Northern Pike and Rainbow Trout - as cold smoked, warm smoked or marinetad (gravlax). In slices, pieces or fillets. The Nordic caviar Vendace roe and Rainbow trout row. Come and pick your favorite! We didn't expect it to be here this soon, only later this week, but luckily we were so very wrong! Gravlax, salty spreadable butter Bregott, cottagecheese Keso, fresh thin bread and Hönökaka-bread are here again! when it has come fresh from oven ... AND NOW IT IS HERE! Together with warm smoked white fish (sik, siika), cold smoked northern pike (gädda, hauki) and cold smoked rainbowtrout (regnobågslax, kirjolohi) in slices! 22.9.2015 Our web-shop will be opened very soon! 24.8.2015 New, adjusted schedule for homemade products! To match your demand better, dear customers, we have adjusted the timetable for our homemade products. Enclosed the revised version of our schedule showing when fresh products are available. This will be followed from tomorrow, Tuesday 25th August onwards. Please remember, if you should want a larger quantity please contact us minimum two days in advance. More over, for special occasions, or just for fun, we can always make other delicacies for example "sandwich cake" (=smörgåstårta, voileipäkakku) or "assiette dégustation" on order. From 21st July until 22nd August the boutique will be open only in the afternoons 15h - 19h. Some snacks will be served and you may naturally enjoy a cup of coffee or soft drink while doing your shopping. Home made products are available as frozen but chocolate balls of course as fresh. 12.6.2015 All you need for your genuine Nordic Midsummer is here! Loads of new products and of course old favorites are here for you. Time to prepare for the Midsummer! All dairy products are of course lactose free. - Noblesse from Marabou, perhaps the thinnest chocolate in the world, seductively good and so thin that you can treat yourself many! "For a long time I have not felt such vibes and feeling of togetherness, socializing was so nice and comfortable that we barely noticed we were eating. Nordic Temptations is like a warm heart connecting people without borders. Such places are needed in the world!" 27.5.2015 School's out for summer soon! Soon time for end of the term in schools - Come and check out our ready made giftbags or collect items according to your individual choice! Helena Petäistö uncovers (in Finnish) her own and French friends' address books and the most unbeatable tips will never let you down. Her piquant style guarantees a fun reading experience for everyone! The fifth revised edition from Spring 2015. Mitt Nice (=My Nice) by Kristina Svensson is a different and temptating guide to Nice in Swedish. It is a part of a series of inspiring guides which all are written by people with good local knowledge. Catering at party organized by Finnish Film Foundation (Suomen elokuvasäätiö) in Cannes. More than 300 invited questes consisting of for example directors, representatives from production companies, sales companies and film festivals. Once again we had a succesful and wonderful evening. It is always a real pleasure to introduce the Nordic delights: on the tasting plate of fish we had for example warm smoked whitefish, eel and perch together with home made curry herring and delicious new potatos. 15.5.2015 Loads of fresh smoked Nordic fish has arrived! Please note that on Saturday 16th May we will be open from10 h only until 18 h, non stop. On Saturday 16th May we transform the boutique again to a restaurant, this time with a typical Nordic summer menu. reservation is obligatory. 14.4.2015 Adorable new Moomin, Pippi Longstocking and Emil of Lönneberga products have arrived! If you want your diet to be low in fat and high in B-12, omega-3, omega-6 and essential fatty acids, you might think your only choice is a trip to the fish market. But a recent study from the University of Tromsø shows that reindeer is one of the healthiest kinds of meat you can put on your plate. 26.3.2015 Fresh fish for your Easter table have arrived! Smoked Eel has now joined the old acquaintances White Fish, Northern Pike, Salmon, Atlantic Halibut and Rainbow Trout. Available as smoked and/or warm smoked, see latest listing of the products. 14.3.2015 Mignon Eggs and Mämmi have arrived! We have just received a delivery consisting of for example heaps of rye bread, Mignon Chocolate Eggs and fruity Easter Candies from Finland. As novelties we have this time Nalle Oatmeal with wheat bran, whipped cream without lactose and after a long time even Black Pudding from Tampere. And of course all other earlier favourites are back! Please notice that this is the last delivery of products from Finland before Easter. Did you know that the Mignon Eggs are the second oldest Fazer product dating back from 1896? Each egg is hand made by first cutting a hole in a real chicken egg and removing the contents, the shells are then sterilised and filled with a deliciously creamy chocolate filling containing hazelnuts and almonds. The eggs are then plugged with sugar and are presented in a neat little box. The filling is lactose free. Store at room temperature - but you may find the shell easier to remove if you chill the egg for a short while before consuming. The first batch of Mämmi (memma) the Finnish special looking Easter dessert is now ready! 11.3.2015 Spring has arrived in the boutique with lots of lovely new products! 7.3.2015 Recipes in English - Recettes en français! The variety of nationalities was enormous, our happy guests came from for example Italy, Venezuela, France, Sweden, Denmark, Ireland and Finland. Our Chef Jarmo made a major job and we were glad to serve delicious traditional Nordic dishes. And as always, we couldn't have managed without the help from Susanna. Next edition will take place on Saturday 16th May with a new menu according to season! 11.2.2015 More additions to selection! No need to struggle with the French dish washing liquids any more, we now store Fairy, also known as YES in Sweden. 8.2.2015 Long-awaited products are now here! With frozen wild berries, game meat, new potatoes and dill you will at any time have the possibility to achieve the real Nordic taste experience. In the attached pictures you will see all the latest additions to our selection. 7.2.2015 Time for "Semlor - Laskiaispullat" - next baking days 14th February and 17th February! On Sunday 15th February we transform the boutique again to a restaurant, reservation is obligatory. During the rest of this week there is a possibility for tasting of all the smoked fishes that we have in our selection: salmon, rainbow trout, white fish, pike and Atlantic halibut. Available as fresh today: cinnamon rolls, sweet rye bread, blueberry pie and in the afternoon lighter rye bread. Västerbotten-cheese can be used in various ways in cooking, find some inspiration on http://vasterbottensost.com/en/recipes-menus/ (the recipes can also be found in Swedish and Finnish) Special price on Västerbotten today and tomorrow € 11,90 for fresh and € 10,90 for frozen. Would you fancy something more familiar the sausages Falu-korv, Juustokabanossi and Metrilenkki are on 25-50 % discount this week. The inluenza season is here and we have a natural way for you to protect yourselves: Tasty vitamin C bomb made of sea buckthorn powder or delight your day with a delicious breakfast or dessert dish Whipped Cowberry Semolina pudding using our dried lingonberry powder, it contains even way more vitamins than fresh berries. May the New Year give you the strength to face the challenges of life and courage to adjust the sail so as to take every situation to your stride. It brings new ideas and hopes for us to make our lives good to better and better to best. Happy New Year! - Gott Nytt År! - Onnellista Uutta Vuotta! - Bonne Année! 24.12.2014 Merry Christmas - Joyeux Noël - God Jul - Hyvää Joulua! Even though many of you are already preparing the Christmas Eve we are baking loads of cinnamon rolls today, even some sweet rye bread left from yesterday. For your last minute shopping open as usual today from 10h to 19h. Opening hours during the holidays enclosed. We wish you all Merry Christmas - Joyeux Noël - God Jul - Hyvää Joulua! Prior to independence 1917, Finland formed an autonomous Grand Duchy in the Russian empire for 108 years, and before that it belonged to the Swedish kingdom. During the Second World War the Finns had to defend their freedom. Interested how the Finns celebrate the Itsenäisyyspäivä? On the Independence Day we have a little party in the evening for Finns and Finnish-minded from 17.00. Evening includes snacks and drinks with live broadcast of the Reception in Presidential Palace. Our TV will be tuned to Finnish national channel even earlier broadcasting live for example the original film "The Unknown Soldier" from 1955 at 13h and the military parade from Hämeenlinna at 16h. Welcome! 1.12.2014 Countdown to Christmas with a calender! Over 100 people visited us on our anniversary day, thank you all for the congratulations which were passed by sms, facebook or by you personally! The home made mulled wine of apples (äppelglögg, omenaglögi) and gingerbread cookies were a success, on your request we have decided to make them also for sale! On the Facebook it is possible to give reviews. Until now there are altogether 16 of which 15 people have given us 4 or 5 stars the maximum being five. The average of the reviews is today 4,6! Thank you all! the fishes we have had for sale for a couple of weeks now have been proven delicious! The fishes for Christmas will be delivered on 17th December with best-before-dates 14 to 21 days ahead depending on product. These need to be ordered in advance by latest this Saturday 22nd November. Tasting is possible in the boutique. Another additions to Christmasproducts are: Red cabbage Felix (rödkål, punakaali) 550 g € 4,60 and- Sauna-smoked ham i piece Korpela (basturökt skinka, saunapalvikinkku) 350 g € 10,- Also these need to be ordered by latest this Saturday. On Fridays from now on we will be serving home made berry pies to be enjoyed on the premises or for takeaway, tomorrow it will be blueberrypie. Another addition to the Café menu is "Smoked Northern Pike on rye bread"
Lighter rye bread is something that we have baked already a couple of times but because all has been sold within only hours we have not been able to mention about it. Freshly available every Thursday afternoon. In the first seating we had 13 guests consisting of French, Swedish, Danish and Finnish people. Relaxed atmosphere with for example spontaneous singing as always when Swedes are with! The second one was an intimate occassion with only four people most of them French. They were very curious about the Nordic food and the way of living and very pleased of this familiar situation where we were able to improve their knowledge. On top of all we were also interviewed for the MyTF1 news! Today 11th November is a national holiday so we will be closed but preparing for all the happenings later this week. Due to Restaurant Day we will close on Saturday 15th November already at 17h. To make sure you get everything you want for your Christmas table we strongly recommend to order in advance, last day for this is Friday 14th November. On Saturday 15th November we will turn our boutique to a restaurant during one evening serving Nordic specialities. The amount of places is limited so we will have to seatings, the first starting at 19h and the second at 21h. Pre-booking is advisable. 5.11.2014 Welcome winter, we are prepared! Tens of lovely hand knitted socks and leg warmers were delivered personally by Leila. Million thanks belong also to the other knitters Ritva Kivi, Anna-Liisa Schöld and Riitta Virtanen!